Condition is Used. All functions work perfectly. On top of that, the physical condition of the machine is excellent. Includes manual and optical digital connecting cableAlso included: three blank minidiscs, either 74 or 80-minute capacity. In excellent condition, barely used. Includes original 6V AC adapter. Sony HiMD MiniDisc Walkman MZ-NHF800 portable AM/FM with original wired remote control. Can also play and record standard minidiscs. TESTED play, record and radio. This was my personal unit for awhile and I recorded a few concerts with it, but I rarely used it. Cosmetically great condition. Battery compartment clean. No headphones. Sold AS-IS due to age. Shipped with USPS Priority Mail. RARE Sony MD Walkman Mini Disc Player Portable Digital Net MZ-E44. Works perfectly. Cosmetically in perfect condition. Some corrosion on the inside, but this does not affect functioning at all. includes hard to find and expensive gum stick battery and universal charger. Shipped with USPS First Class Package. It is in perfect and pristine shape, works flawlessly both playing and recording. It sounds beautiful, and because it is a Net MD you can edit titles on your computer, and you can upload mp3s to it via USB. Earbuds included (not in picture). Pre-owned; EXCELLENT Condition. Condition is Used. 2 sealed blank minidisc. The rest of the minidisc looked like they were recorded on. 1 Sony digital recording mini disc Walkman. 1 Case for the Walkman. 1 Power cord. Walkman Sony MZ -NE410 NetMD With 5 Disc. Condition is Used. Shipped with USPS First Class Package. Aiwa AM-F70 Portable Minidisc Player/Recorder. I have been a huge fan of this portable MD device, but it’s time to let go. Item is in working, used condition. Backlighting works as seen in the photos. Item does NOT include a battery, as the original “gumstick” Aiwa battery died years ago. The AC adapter included isn’t original, but powers the device without issue. No discs, case, or accessories included. Please contact before bidding with any questions and happy bidding! Shipped in USPS Small Flat Rate Box. 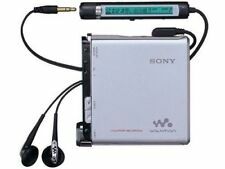 Sony MZ-N510 Type S NetMD MDLP MiniDisc Walkman Recorder/Player. Condition is Used. Shipped with USPS First Class Package. Player in very good cosmetic condition.Light scuffs and scratches from normal use.Fully tested and cleaned. Batteries not included. From smoke and pet free home. Thanks for looking please check out my other items. EXTRA SLIM. YOU CAN USE A AA BATTERY TO OPERATE PLAYER. THERE ARE SURFACE SCRATCHES IN FRONT AND BACK OF THE UNIT, BUT WORKS FINE. AND 2 NEW SONY DISKS. You are looking to buy a Sony Minidisc Recorder Model No. MDS-302. This item is in good used working condition. Please contact me for further questions or for more pictures. Thank you. Sony MZ-R900 Walkman MiniDisc Player, Rare Full Set !! Nice Shape & Working !!! SONY MZ R900 MD Walkman MiniDisc Player, Beautiful Shape ! Really Warm Tone ! High quality and Smooth communication are our core service value, we love to find your favorit player for your dream collection ! 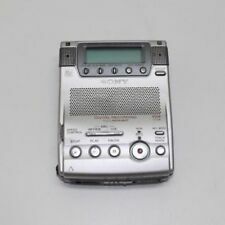 Sony Portable Mini Disk Recorder MZ-R37 Working. Condition is Used. Shipped with USPS Priority Mail. Working as pictured. Have not tested with a disc. Any questions please ask!! The discs in this lot are blank to the best of my knowledge so you can make your own. Used: Sharp MT77. 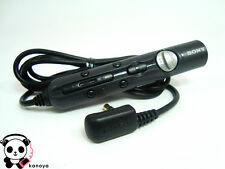 A / The apparatus includes - tested with rechagrgeable battery : the MD Portable works well;. - Tested on taplo MD portable works well;. - Dock Charging. - Main body. - After removing the button to open the disc, the lid expands sharply and the disc is released without problems;. Sony MZ-R900, very good condition. Fully functional. 1 Audio cable. RCA males to stereo male mini jack. (unopened). 2 nos, Sony 74 min blank minidiscs, unopened. (provided in addition). This unit is in mint condition and works great. Unit has been tested for record and playback and all buttons and optical ports were tested too! Great for running or on the subway. EXCELLENT PERFECTLY WORKING CONDITION. A FEW DINGS FROM USAGE. FULLY TESTED AND WORKS PERFECTLY. NO OTHER ACCESSORIES. Unit tested and is In good working condition. Sony Mini Disc MD Walkman MZ-R70 Digital Recorder and Player - USED. And More. Also included is the minidisc PC link with usb cable, stereo mini audio cable, charger, user guide that is an assortment of pages printed from online, 10 blank labels, and 55 mini discs with an assortment of audio on them that can be deleted and recorded over. One or two of them have been recorded over twice and are marked with crossed out labels. 24 of the discs are in the included Case Logic case, 30 are in the plastic cases, and one is in the mini disc player. Tested and working MiniDisc Player Needs 1 AA battery not included. Includes 4 unopened Sony Recordable MiniDiscs and 2 used and opened Recordable MiniDiscs. This unit has been fully tested and is working great. Sony Walkman MiniDisc Player & Recorder MZ-N505 Type-R MDLP Net MD Tested Silver. Condition is Used. Shipped with USPS First Class Package. Works good. Sharp MD-MT15S Portable MiniDisc Player/Recorder w/15 Discs 1 MUSIC MD " sponge"
Sony Walkman Portable Minidisc Recorder MZ-N510. Condition is very good. Only cosmetic flaw is discoloration on top probably from the sun. It works well but the remote doesn’t seem to work. I tested it working on AA battery. There are 37 recorded disc. They are all from the era of the Eagles, Rolling Stones, Beatles, Jimmy Buffet, Pink Floyd, Beastie Boys, U2, REM, The Doors, Bob Marley, and Fleetwood Mac. That list is to give you an idea of what is included. It all came from an estate. Vintage Sony MZ-E60 Portable Minidisc Walkman Blue. Minidisc player is fully working just has some scuffs. Payment due within 3 business days of auction closing. Usually ships within 3 days of payment.Zero feedback buyers payment due within 24 hours. Non US buyers please ask before bidding. New ListingSony Mini Disc MD Walkman MZ-R70 - Tested and Working - Discs, Manuals, etc. For sale is a Sony Mini Disc MD Walkman MZ-R70 that has been tested and is working (see pictures). Also included is the remote, optical cable, all manuals, carrying bag, AC adapter/charger, minidisc case, and 8 multi-color minidiscs that are just loaded with some techno, hip-hop, tv-themes, and some other random stuff (I was clearly a super cool teenager). This will be well packaged in a USPS flat rate medium box. 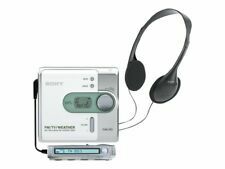 SONY PSYC MZ-DN430 MINIDISC WALKMAN PLAYER . Condition is Used. Ships to all states minus Alaska and Hawaii I have not used this unit in years however it was working last time I used it and it's been in a droor for that amount of time. There is no corrosion in the battery compartment and the unit powers on. Unfortunately I have no mini disks to test out. SONY MZ-R30 Minidisc MD Player and Recorder. Condition is Used. Shipped with USPS Priority Mail. MiniDisc digital recording devices produced by Sony can be used to record audio. They can come in handy when you need a portable tool for recording content that needs to be stored on physical media. These players use the proprietary Sony MiniDisc technology. The Sony MiniDisc is a small form of storage that is shaped like a tiny CD. These little CDs can hold up to 74 minutes of audio or up to 1GB of other types of data. The MiniDisc was designed for the storage of sound, but the capacity of these discs does allow you to store a small quantity of video. The capacity of a MiniDisc player is based on the storage capacity of the MiniDisc itself. These discs are designed to provide longevity and high sound quality. They are manufactured by Sony and are typically used in portable Sony-branded applications. What can MiniDisc recording devices be used for? These recorders can be used to store up to 74 minutes of sound on one disc. This technology can be useful when you need to physically archive recorded contents, such as legal or governmental recordings, instead of just storing them in the cloud. Higher quality MiniDisc tools can be used to record audio from concerts, piano recitals, speeches, and other types of gatherings. Personal MiniDisc players write directly to the physical media instead of requiring you to use a computer to burn the data onto a CD. What format does a MiniDisc recorder use? A personal MiniDisc player records audio in Sony MD format. These include the original MD format and the later Hi-MD format, which was introduced in 2004. Hi-MD discs can be converted to MP3 files on your computer when the SonicStage software is used. What features do portable MiniDisc players have? MiniDisc players often include some form of anti-skip protection. This is designed to prevent the disc from being damaged if you record while in motion. Most MiniDisc players manufactured by Sony include Windows-compatible SonicStage software, which allows you to upload and convert data from the MD or Hi-MD format to other digital file types, such as MP3 or WAV. Since your computer is not likely to contain a MiniDisc drive, the Sony player can plug directly into the computer. Portable MiniDisc players are typically powered with AA or AAA batteries. Some require just a single AA battery.